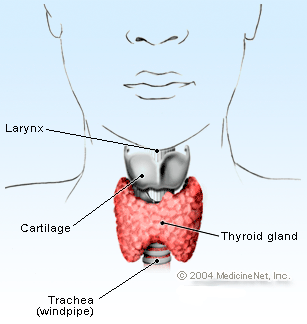 Thyroid gland is a lobular endocrine gland, typically with 2 lobes. It is butterfly-shaped and located at the neck below the larynx. Thyroid gland is made of follicles and each of these follicles is surrounded by a layer of follicular cells. The follicular cells function by producing thyroid hormones and then store it at the centre of the follicles as colloid. The interstitial area is made of blood vessels that supplies blood to the thyroid gland. 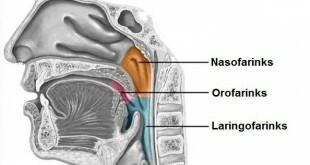 There are also parafollicular cells that secrete calcitonin. Calcitonin is a hormone that regulates calcium level in the blood. However, it does not act with thyroid hormones. The size of a thyroid gland varies with age, gender, nutritional status, etc. 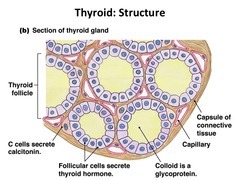 Thyroid hormones are synthesized from components of amino acid tyrosine and iodine in the follicle cells. Two major types of hormones that are being produced are thyroxine (T4) and tri-iodothyronine (T3). Both hormones bind to a protein known as thyroglobulin. Production and secretion of T3 and T4 into the blood circulation are regulated by negative feedback mechanism of the hypothalamic-pituitary-thyroid axis. Thyrotropin-releasing hormone (TRH) from the hypothalamus will stimulate thyroid-stimulating hormone (TSH) from the pituitary gland to activate thyroid gland, which will then releases T3 and T4 into the blood stream. 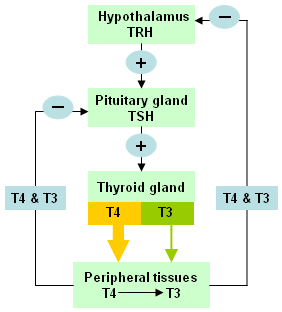 Secretion of TSH is stimulated by TRH where the sensitivity of the pituitary gland to TRH changes depending on factors such as fasting, temperature, emotional state, etc. Elevated level of T3 and T4 in the blood circulation will inhibit TSH and TRH activity. It increases oxygen consumption of almost all organs in the body except the brain, lymph nodes, anterior pituitary, gonad, thymus and lymph. This response directly increases heat production rate and raises body temperature. Thyroid hormones are involved in all aspects of carbohydrate, fat and protein metabolism. It helps to control glucose and cholesterol levels in blood. It is also involved in protein synthesis for normal somatic growth. It is needed to stimulate growth and maturity of skeletal bones. In babies, thyroid hormones help in growth and development of the brain until early childhood. It raises heart rate and its contractile force. Thyroid hormones boost cardiac response towards catecholamines namely adrenalin and noradrenalin which are secreted by the hypothalamus. Impaired function of thyroid gland will cause body metabolism to be faster or slower from what the body actually needs. These abnormal conditions are categorized as hyperthyroidism or hypothyroidism. In these conditions, TSH will be elevated while T4 will decrease from the normal range. Hyperthyroidism is a condition where excessive amount of thyroid hormones are being secreted in the blood and accelerate body mechanism. The following factors could lead to the condition. 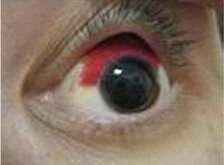 In this condition, TSH level will be lower while T4 is normal or elevated compared to the normal range. When thyroid function test should be done? Patient is not required to fast. However, as certain medications can interfere with these tests, do inform your doctor about any drugs that you are currently taking. Testing for TSH level is important to evaluate thyroid function status. Elevated or reduced TSH level outside the normal range indicates possibility that the thyroid gland is not functioning well. Free-T4 is not bound to thyroglobulin. It is T4 in its active form which can enter the various target tissues to exert its effects. For thyroid function test, FT4 should be given priority and analyzed together with TSH. Total-T4 binds to thyroglobulin and is non-active because it cannot enter target tissues. T3 test is used to diagnose hyperthyroidism or to determine the severity of the disease. T3 testing is rarely helpful in diagnosing hypothyroidism. The commonly measured antibodies are thyroid peroxidase antibody and thyroglobulin antibody. Usually these tests are requested when TSH, T4 and T3 shows abnormal thyroid function. It is meant to detect cause of autoimmune disease whether it is thyroid- related or non-thyroid related. ThyroglobulinThyroglobulin is measured to assess effectiveness of thyroid cancer treatment. Its usage in hypothyroidism and hyperthyroidism is less significant. The normal range for each tests are different depending on methodology and analyzer used in the laboratory. Results interpretation must be supported with clinical diagnosis by a doctor. Tietz Fundamentals of Clinical Chemistry. Carl A.Burtis, Edward R.Ashwood, BavidZ.Bun, NW Tietz. Saunders Elsevier, 2008. Fisiologi Manusia. A.Raman, Ruby Husain, S.K Lam. FajarBakti, 1990. Practice Guidelines for Thyroid Disorders. The Malaysian Consensus 2000. Malaysia Medical Association, 2000.